Like dot-com moguls in the ’90s and real estate gurus in the 2000s, farmers in western Kansas are enjoying the fruits of a bubble: Their crop yields have been boosted by a gusher of soon-to-vanish irrigation water. That’s the message of a new study by Kansas State University researchers. Drawing down their region’s groundwater at more than six times the natural rate of recharge, farmers there have managed to become so productive that the area boasts “the highest total market value of agriculture products” of any congressional district in the nation, the authors note. Those products are mainly beef fattened on large feedlots; and the corn used to fatten those beef cows. But they’re on the verge of essentially sucking dry a large swath of the High Plains Aquifer, one of the United States’ greatest water resources. The researchers found that 30 percent of the region’s groundwater has been tapped out, and if present trends continue, another 39 percent will be gone within 50 years. As the water stock dwindles, of course, pumping what’s left gets more and more expensive—and farming becomes less profitable and ultimately uneconomical. But all isn’t necessarily lost. The authors calculate that if the region’s farmers can act collectively and cut their water use 20 percent now, their farms would produce less and generate lower profits in the short term, but could sustain corn and beef farming in the area into the next century. But I think it’s also worth asking what, exactly, they’d be sustaining. 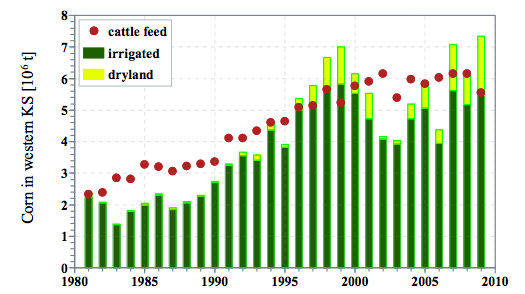 The following chart, pulled from the study, shows the amount of corn grown in the region since 1980—both irrigated and un-irrigated (i.e., grown without added irrigation water), as well as the amount of corn that has been consumed by cattle in the region’s feedlots. The latter metric, denoted by the red dots below, is a pretty good proxy for just how teeming those feedlots have gotten over the decades. From: “Tapping unsustainable groundwater stores for agricultural production in the High Plains Aquifer of Kansas, projections to 2110,” by David Steward, et al. One major culprit has been a shift in what farms grow—from a rotation featuring corn, wheat, and sorghum to a narrow focus on a single crop that flourishes under heavy irrigation and has been in high demand lately: corn. A shift to growing corn, a much thirstier crop than most, has only worsened matters. Driven by demand, speculation and a government mandate to produce biofuels, the price of corn has tripled since 2002, and Kansas farmers have responded by increasing the acreage of irrigated cornfields by nearly a fifth. At an average 14 inches per acre in a growing season, a corn crop soaks up groundwater like a sponge—in 2010, the State Agriculture Department said, enough to fill a space a mile square and nearly 2,100 feet high. And here’s a map of US feedlot beef production, courtesy of Food and Water Watch. The dark red shows what Food and Water Watch considers an “extreme” concentration of beef production. All of which makes me think that the real salvation of the High Plains Aquifer lies in moving away from the practice of growing great monocrops of corn and feeding the proceeds to penned-up cattle.